Bringing this thread back to the forefront. Want to revive if for all of our charting enthusiasts on Stockaholics. Please feel free to post up any chart in here! Here was an interesting chart setup that was mentioned from last week. 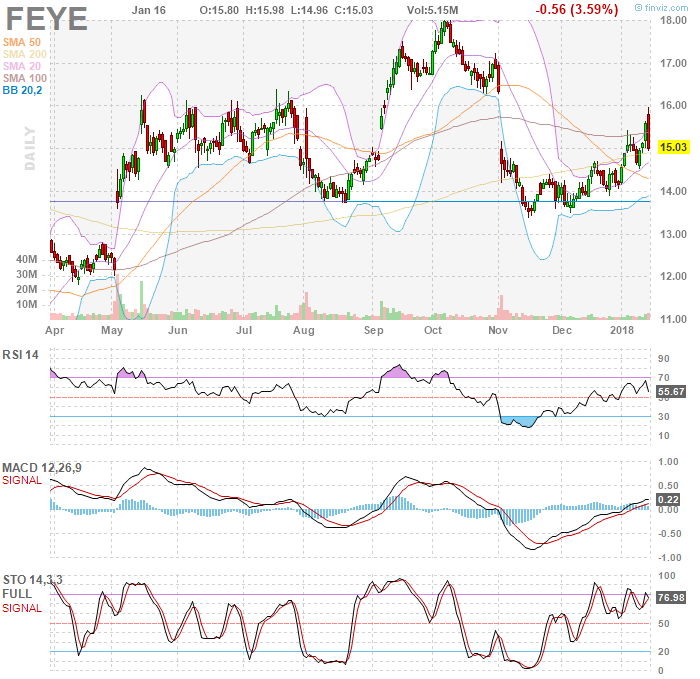 Full credit to @Three Eyes for first pointing out this chart on the FEYE thread at the beginning of the year. Nice bounce off the 20sma again this past week and now into the November gap. 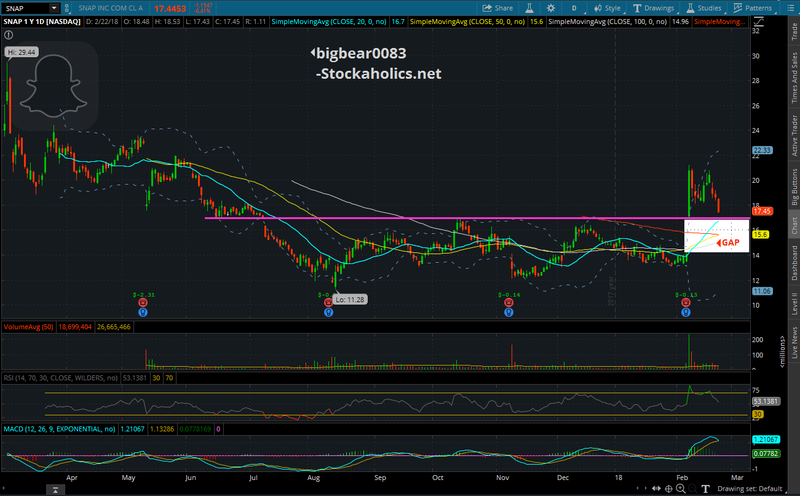 Continuation up to fill the gap here? 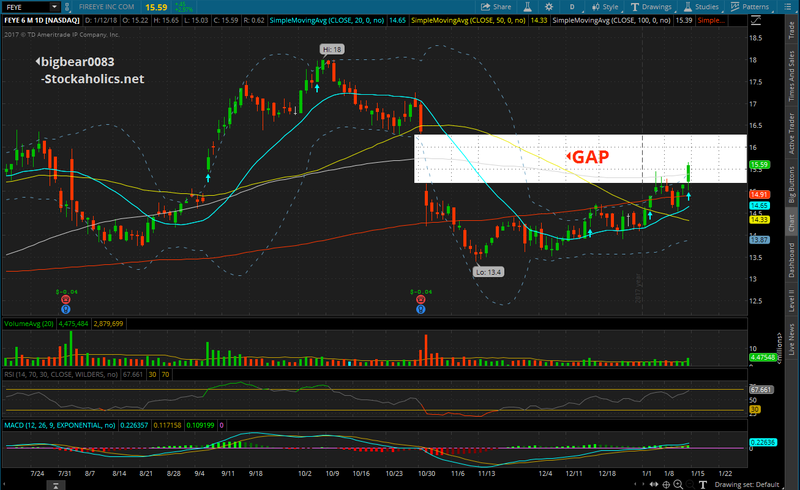 No gap fill. Don't like that the 50 crossed below the 200. Looking at resistance ~16. Steven_Burt, Three Eyes and bigbear0083 like this. Good call there Marcy, that is precisely where it found the resistance today. any interesting chart setups you guys are eyeing this week? going to try to add to this thread a bit more regularly in the weeks to come. was meaning to post this in here yesterday but got super busy entertaining some guests last night. anyway, not trading this but just throwing it in here as an attempt to get this thread active again. thought this looked like a short yesterday. coming into that $17 level and rising daily 20sma where could see a bounce, but if that doesn't hold then it's into gap territory. I agree! Looking at the volume-by-price over the past 12 months, I see a lot of longs with a 21-23 basis price who are looking at this recent pop as a chance to unwind. And with all that volume on the bottom side of the gap you identified, I think there's more downward pressure to retest the consolidation levels. An interesting question: will it fill the gap, or will it bounce off the rising 50 DMA? looks like now into that aforementioned gap heading for the MA's ... will be interesting to see if this does bounce around there or if it does fill the gap. hope you're enjoying the time off @Three Eyes missed ya round here. ^ Filling the "Kylie Jenner" gap. Ahhh, come on you guys...let's clean it up in here. Barely clinging to some bandwidth floating around the swamp tonight to check in on you guys. Looks like all is in order! Expect to be back in signal-range sometime over the weekend. I see SNAP bounced today! Will it follow-though....??? TSLA has been good for quick-bounce plays (perfect for unhedged-options trading, especially) pretty much since last May, but expanding the chart in time a bit I see there are some gaps left over from last Spring that have not been filled. Onepoint272, bigbear0083 and T0rm3nted like this. I've enjoyed monitoring the PAYX 5-minute chart this week, watching to see if it will make a run at new 52-week highs that were set in October 2018. I drew 3 short term trend lines and PAYX blew through the first one and violated the 2nd one but is currently riding it up. But check out those end-of-day volumes. It looks like the MM has been trying all week to shake out weaker longs to build supply for a series of bigger purchases this week. The OBV in the daily chart below helps confirm that institutional money continues to build positions in PAYX. What do you all think? New highs next week or no? It's got a chance, but my prediction is double top at 76 then pullback. I like that the relative strength has held onto the top Bollinger Band. So although PAYX itself is pulling off of it, it still has uptrend so it could still get back there. Trouble is it's got to go 3% higher, and market has VIX staying above 15. For my prediction, I say it doesn't have enough right now to break through in the next week. Three Eyes, bigbear0083 and T0rm3nted like this. Nice post! Thanks for bumping this @Three Eyes, I completely forgot all about the existence of this thread lol. BTW, I just gave this thread a new name. Let me know what you guys think of that one...or if you had a better one in mind that was maybe more enticing for viewers, let's hear it. I kinda like to see this thread get more action like the Daily Trading Thread does here. Not really sure if that new thread name will do the trick though. 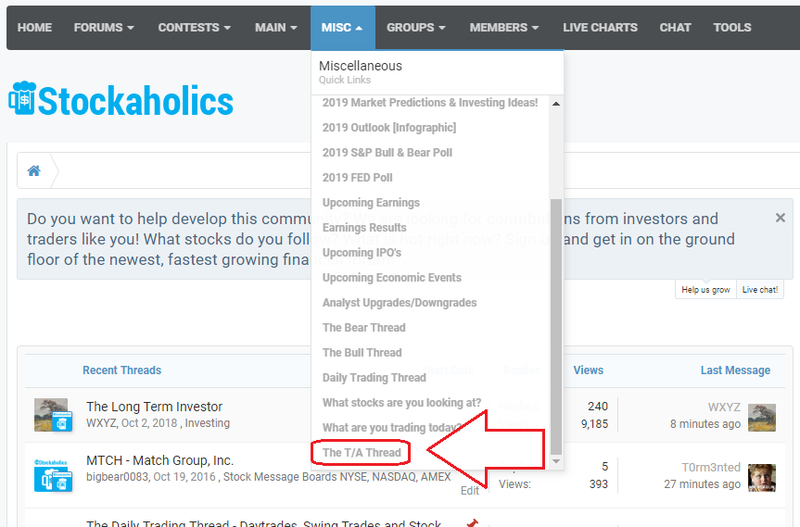 I also added the link to this thread under the "Misc" drop down menu on the navigation bar at the top as seen in my screenshot below, and have also stickied this thread to the Stock Market Today section, and have pinned this thread as a featured thread onto the front page here as well for better visibility. Three Eyes and anotherdevilsadvocate like this. That's great! It took me a view minutes earlier today to find this thread. Thanks @bigbear0083 ! Appreciate your perspective ADA! Thanks! Given the close today, I suspect I'll enjoy monitoring the 5-minute bars next week, too. Last week was rough on KO, but this divy aristocrat has been a machine the past couple years. Thinking longer term on this one, I like how KO found support at the 50 WMA. The OBV has really held up super well during the fluctuations in price. The key question now: is this machine still "on" thus making this a good time to accumulate shares?